The new generation of Chauhans has diversified beyond the ubiquitous Parle-G biscuit into western and traditional Indian snacks. For more than 80 years, it's been a popular landmark in suburban Mumbai. Ask any shopkeeper in Vile Parle for directions to the Parle Products factory and he won't think twice. "Just turn into the next lane and thereafter, the aroma of the Parle-G biscuits will automatically lead you to the factory," says a paan shop owner with a smile. Chances are if you ask people anywhere in India about Parle, they will break into a similar smile. For millions of Indians such as the Mumbai paan shop owner, the country's largest biscuit maker doesn't just make any other biscuit: it makes comfort food. Across the country, many people wake up to the same ritual every morning: they dunk a crisp Parle-G biscuit into a hot cup of milky tea and quickly pop the soggy piece into their mouths before it disintegrates in the steaming brew. Parle may be synonymous with the ubiquitous glucose biscuits for many, but competition has been nipping at the biscuit manufacturer's heels. Although it is still the market leader in the Rs 21,213-crore biscuit market, shop shelves are groaning under the weight of a host of other biscuits - and consumers are biting. 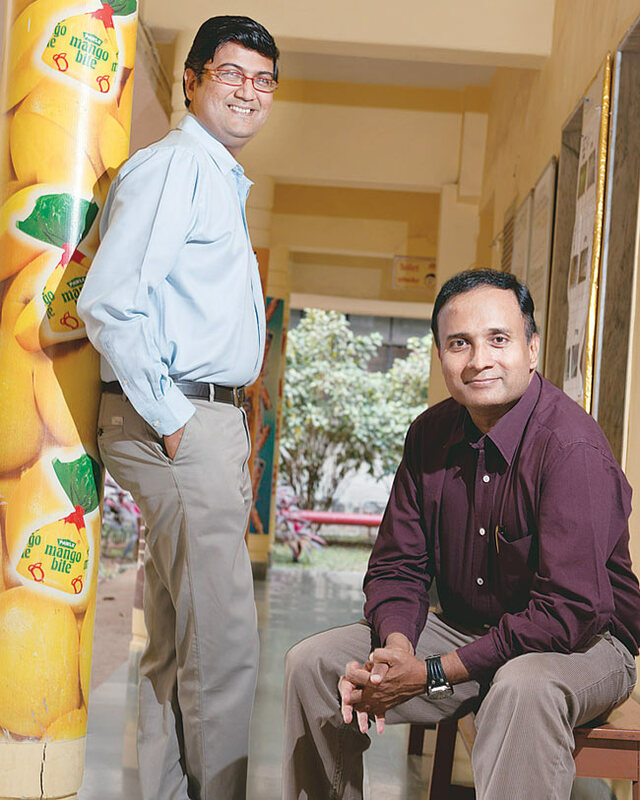 With an increasing number of biscuit makers jostling for a share of the pie, the third generation of Parle's Chauhan family - cousins Ajay and Arup - has turned to the snack market and premium biscuits to stay ahead in the game. "We already have a strong presence in biscuits and confectionary. In the food category, snacks form one of the fastest growing categories, so it was natural for a company like ours to venture into the snacks market," says Parle Products Executive Director Ajay Chauhan, who has been in the business since 1989. The Rs 9,000-crore company got into the snacks market in 2008 when it launched western snacks such as potato wafers and chips, and has since added traditional Indian snacks such as aloo bhujjia and moong daal to its product range. According to industry estimates, the company has just six per cent of the Rs 5,565-crore western snacks market, which is dominated by global giants such as PepsiCo, but is pinning its hopes on traditional Indian snacks. Ajay says the gameplan is to grab 20 per cent of the Rs 3,198-crore organised Indian snack market by 2014. But it is unlikely to be a cakewalk. Parle has to take on traditional snack giants such as Haldiram, which controls over 45 per cent share of the market, and Ahmedabad-based Balaji, which has a close to 19 per cent share. 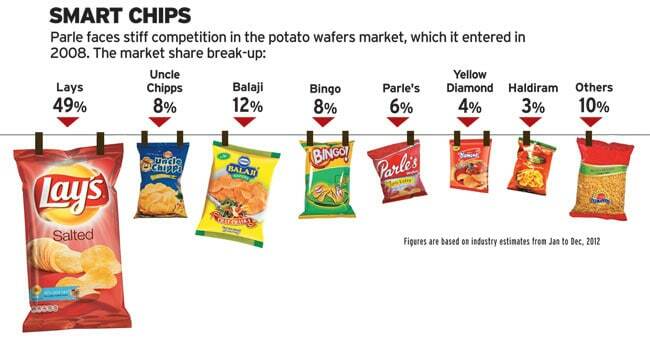 The biscuit maker has already faced some bruising competition in the western snacks market: it launched its western snacks under the brand names Must Chips and Must Stick five years ago, but dropping the Parle brand name did not quite work. The company re-launched the products as Parle's Wafers and Parle's Full Toss in 2009 and its market share jumped almost immediately. It is still way behind PepsiCo's Lays which has a 49 per cent share of the wafers market, but has narrowed the gap in the past few years. Parle has had several learning experiences in the snacks market. It got into the health snack category with Monaco Smart Chips in 2009. But the product bombed and the company had to withdraw it within six months. Parle's snacks business head, Krishna Rao, says it was ahead of its time. "Smart Chips appealed to the upper end of the pyramid. Instead of launching it only in modern trade, the mistake we made was to launch it as a mass brand," he says. When Parle launched its western snack portfolio in 2008, PepsiCo's Lays had a close to 70 per cent market share. The biggest chunk of Lays' market share came from the top 10 cities. Parle relaunched in 2009 with a much sharper focus: it zeroed in on smaller towns and played the high-volume, low-margin game which it has successfully mastered in its biscuit business. It started offering more for the same price. A pack of Parle's Wafers priced at five rupees contains 15.6 grams of chips, while a pack of Lays has just 12.5 grams of chips for the same price. "Snacks have been taking away market share from biscuits in some markets. Therefore, offering more for the same price made a lot of sense," says Pravin Kulkarnii, General Manager, Parle Products. Getting into the snacks market has forced Parle to constantly rethink its strategies. For example, it launched its snacks business with one distribution team for both snacks and biscuits, but in 2010 set up a dedicated distribution team for snacks. Market experts say distributing and marketing snacks is quite different from doing the same with biscuits. The main difference is shelf life, says Sunil Alagh, former Managing Director of Britannia Industries, who now runs his own consulting firm, SKA Advisors. Unlike biscuits, which have a shelf life of more than six months, a snack product has to be consumed within two months of manufacturing. "It requires faster replenishment. Even the way a snack packet is displayed at a retail store is different," he says. Alagh, who burnt his fingers in the snacks business during his stint at Britannia, says the snacks market is much tougher than biscuits. However, industry experts say snacks are a logical extension for a biscuit company because Indians are compulsive snackers. Abneesh Roy,Associate Director (Institutional Equities) Research, Edelweiss, is confident Parle understands the market and will succeed despite being a late entrant. 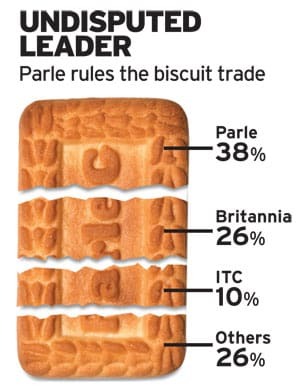 Others in the business say Parle will eventually edge out some of the smaller brands. "Parle is finding it challenging and is certainly not making money in the short-term, but if they are willing to stay and invest, over a period of time they will get stronger and start buying out the regional players," adds Raghu Vishwanath, Managing Director of brand valuation company Vertebrand. Nikhil Sen, Managing Director, Unibic Biscuits India, agrees. "They will eat up the smaller players. I see Lays at the premium end and Parle becoming a large mass player," he says. Market experts say Parle's biggest strength is its mastery of the high-volume, low-margin business. It makes a staggering one billion Parle-G packets a month. A 100-gram pack of its flagship product, Parle-G, was priced at four rupees for more than a decade. It was only in 2007 that the company decided to reduce the weight of its four-rupee biscuit pack to 50 grams after ingredient costs spiralled. It successfully used a similar strategy for its cream biscuits which were priced at five rupees for a 100-gram pack. On the other hand, rival Britannia priced its mass cream biscuits, Britannia Cream Treat, at Rs 10. Alagh says Parle has always been a tough competitor. The company has always had more than 60 per cent market share in the glucose biscuits segment where it never allowed other brands such as Britannia's Tiger Biscuits to come anywhere close. "They sold Parle-G at four rupees for decades, which we couldn't. As a listed entity, Britannia was answerable to shareholders. A margin below 20 per cent was not acceptable. Parle could do this because they were not answerable to shareholders," says Alagh. Mayank Shah, Group Product Manager, says the high-volume business gave the company a sourcing advantage. Parle could source its ingredients at 15 to 20 per cent less than the competition. However, running a lowmargin, high-volume business is becoming difficult because raw material costs have shot up, says 37-year-old Arup Chauhan, who is also Executive Director of Parle Products. In an effort to get around that, the company has cut transportation costs and stepped up production capacity by working with over 100 franchisee manufacturers across the country. The franchisees account for around 60 per cent of total production. After selling biscuits for the mass market for the longest time, the company entered the premium segment in the late-1990s with its chocolate chip biscuits, Hide & Seek. Today, it markets its premium biscuits without the Parle brand name. The rationale behind that is not to dilute the premium image of the biscuits by associating them with Parle, which is synonymous with a mass brand. The premium category accounts for around eight per cent of overall revenue, but Parle hopes to raise that to 20 per cent in the next few years. "We look at creating value for each brand that we launch. We follow a product branding strategy rather than a mother brand strategy. This approach has helped us create the desired differentiation among consumers for various products across categories and price-points," says Ajay. "The one big insight that our seniors have passed on to us is to control costs and not compromise on the quality of our products." Where does Parle go from here? Does it plan to diversify into dairy like Britannia? No, says Ajay. "We see a bigger opportunity in the snacking business and, therefore, we are focusing on it." But now that it has diversified in the local market, the company's next plan is to increase its global reach. Parle already has a presence in 70 countries across Africa, West Asia, the United States and Canada, and plans to double its international presence in the next year. "The vision is to think big and make Parle Products a truly global player," says Arup, who has just returned from the US after sealing a deal with Wal-Mart Stores, which will sell the entire Parle portfolio in the US. International operations account for around eight per cent of Parle's turnover, and the plan is to more than double that in the next few years. It's an ambitious plan, but the Chauhans are confident. They say the biscuit business runs in their blood and they don't remember a day when their fathers did not discuss the family business at the dinner table. "I never thought of an alternative career other than growing my family business," says Ajay.